The Week in iOS Accessories: Wood you? How much wood would a woodchuck chuck, if a woodchuck could chuck wood to make iPhone accessories? We tackle those questions and more in this week’s roundup of new iOS accessories. 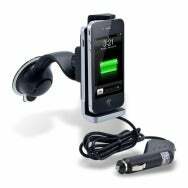 Arkon: The $45 SuperCharge Windshield Docking Mount comes with a pretty self-explanatory name: The device allows you to mount your iPhone on the interior of your car’s windshield while you’re driving, and it includes a cord that lets you power up your device while on the road. It should come in handy for drivers who use their phone’s GPS capabilities to navigate unfamiliar streets; it’s compatible with the iPhone 3GS, 4, and 4S. Denon: The $599 Cocoon is a sleek iOS-dock speaker system that doesn’t need to actually be docked to play your music—its AirPlay compatibility makes it available to wirelessly stream music from any of your iOS devices or computers. (It also comes with a built-in Internet radio, so you can listen to music even when your phone is tucked away.) If the Cocoon is attractive but seems a bit much, you can always opt for the $499 Cocoon Portable, a smaller system. Both Cocoon models will be available later this summer. Desk Pets: The $30 CarBot is a remote-controlled car that can race around the house at high speeds. The remote control, of course, is an app on your iOS device that, in tandem with an adapter plugged into your iPhone’s headphone jack, sends the signals needed to steer, speed, and brake your tiny CarBot. 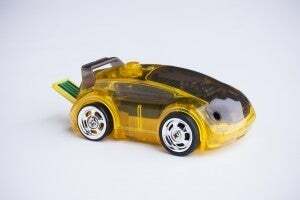 Each car uses included rechargeable batteries; 40 minutes of charge will give you about 25 minutes of play. GroovBoard: We can’t help but notice that an increasing number of iOS accessories use natural wood and old-school construction techniques to create something a little earthier and more elegant than your usual plastic and faux-leather add-ons. Sure enough, the GroovBoard line of iPad stands—each designed to accommocate an iPad and Apple’s Wireless Keyboard—are hand-crafted, one by one, by a local carpenter in Bavaria. There are six different models, each made from a different variety of wood, starting at $69 apiece. 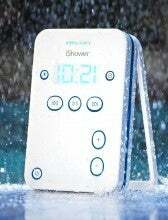 iDevices: Do you wish you could spend more time listening to music while bathing? The $100 iShower makes it possible to stream music wirelessly from your iPhone or iPad to a water-resistant speaker system you can listen to in the shower or bath, or at the pool. The iShower offers wireless range of 200 feet, and the device comes with a clock display so you don’t forget to get out of the shower and go to work. 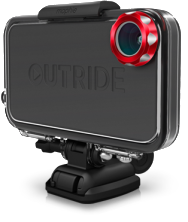 Mophie: The $130 Outride is a kit that transforms your iPhone into an action camera. The case is waterproof and impact resistant, and it features a wide-angle lens that captures action across 170 degrees of viewing. The kit can mount on your surfboard or other mode of extreme sports travel to capture video and photos of your tricks (and your wipeouts). 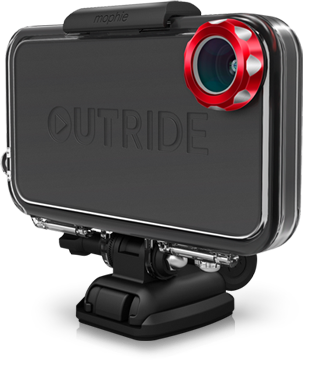 The Outride will ship in September. 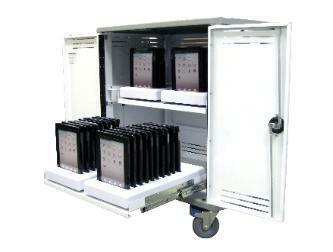 Parat Solutions: This company’s Parasync for iPad Security Cart (PDF link) is aimed at businesses, schools, and other institutions that have a large number of tablets in circulation. The 16-gauge steel cabinet can hold up to 40 iPads at a time, each nestled into a docking station for overnight recharging and syncing to a common iTunes library. The cabinet is 177 pounds empty. Parasync doesn’t publish pricing information, but you can contact the company for more information. Velocomp: The $80 iBike Moto lets motorcycle mamas and daddies attach their iPhone to the handlebars of their Hog. The device is shock absorbant and weather resistant, which means that a little rain and a few potholes won’t end up destroying your phone while riding on the open road. The device is designed to be used in conjunction with the free iBike Moto app, which lets users measure speed, distance, and other vital road-trip statistics on their rides. Vrrooooom! Vers: Offered by another wood-based accessory maker, the $95 1Q is a Bluetooth-enabled speaker that lets you play your music wirelessly from your iOS device. It’s a small wood cube that delivers a large sound, with 30-foot wireless range and 10-hour battery life. The basic price gets you the 1Q in bamboo or walnut; drop an extra $30 and you get a limited-edition model in red beech. Vers has more than met its initial goal for funding the 1Q through Kickstarter; the company is now using the Kickstarter site to take pre-orders. (Each order funds the planting of a tree through the National Arbor Day Foundation.) The idea? To sound good, look good, and feel good.